In a hallway at Stage AE, between dressing rooms No. 3 and 4, is an unassuming gray door with block lettering. 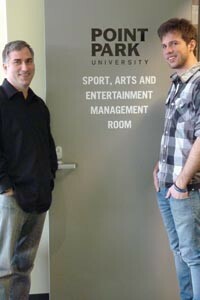 It reads "Point Park University: Sports, Arts and Entertainment Management Room." For now, it's empty except for a few tables and chairs, and a room-length view of the city skyline and the Allegheny River. But it's a brief walk from the venue's 3,800-seat indoor music hall, which has already hosted Wiz Khalifa, Bret Michaels and Girl Talk. And this fall, it will be filled with students from the Sports, Arts and Entertainment Management (SAEM) program in Point Park's business school. "It's going to provide students a leg up and an advantage to understanding this is a bottom-line-driven business," says Steve Tanzilli, SAEM program director. While classes will be taught by Point Park faculty, Tanzilli says the classroom location will "allow that proximity" so students can gain a firsthand view of how the venue is run. "Any time you have the opportunity to intern, or be in the building of the profession you want to be in, is a benefit," says Amy Cooper, director of marketing for PromoWest, which co-owns the venue with the Pittsburgh Steelers and Continental Real Estate Companies. "You get your foot in the door." And in their business, Tanzilli says, "How you get a job is all about who you know." At PromoWest, for example, "We rarely go outside the company and we look for someone who is groomed already in the [industry]," says Cooper. Point Park has partnered with Stage AE since it opened in early December; students serve as marketing/promotions interns, and can do paid work during events. That can be an education in itself. "Certain bands don't let you watch their sound checks or are real high-maintenance," says Nicole Casey, a Point Park senior who works at the venue's guest services. "You get a lot of firsthand knowledge most people don't know." Others have gained perspective on their careers. 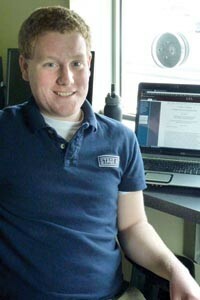 "I wasn't sure what I wanted to do," says Jeremy Olson, an SAEM student and Stage AE intern. At first, his sights were set on playing in his band and touring. But when Stage AE opened, "I wanted to get in right away, and this internship made me realize I want to work at a company like this. The fact that I can say I interned at a venue when it opened -- and I consider this a premium venue -- I think that's crucial experience." Olson has written press releases, run contests and surveyed concert crowds for demographic information. He's also done less-glamorous work, like cleaning up after shows. But Cooper says such varied experience is coveted by employers. Instructors haven't yet decided which courses will be taught at Stage AE. But Tanzilli envisions some obvious choices, including venue and facilities management, and promotion. Tanzilli says the partnership will also give students a chance to run an event there each year. "I want students to be excited," Tanzilli says. "I want them to say they can't wait to work outside this classroom door."